Video: Meet barefoot runner Owen McCall, who makes the case for leaving your shoes at home – even in the winter. Dr. Sherwin Ho, director of sports medicine at University of Chicago and associate professor of orthopedic surgery, says the idea for barefoot running came about because people naturally used to run barefoot for centuries before the invention of the running shoe. Dr. Ho says that running shoes have cushioning in the heel and sole because all of the impact when you land on your heel goes directly into the foot and knee. “The shock absorption from running with shoes is in your knees and quadriceps,” he said. Dr. Ho says barefoot runners have to change the way they run to land on the balls of their feet first -- or risk injury. “When you go to barefoot running, you have to change your running gait. If you don’t, you would get stress fractures in your heel because there’s no padding in the heel,” he said. Dr. Ho has seen patients who have switched from running with shoes to barefoot running, without changing their running style. “I’ve taken care of people who show up with stress fractures in the heel,” he said. Dr. Ho also says that barefoot running adds a new shock absorber to your running gait. “Instead of the knee absorbing all of the impact, now your ankles and calves are involved,” said Dr. Ho. Dr. Ho says that while he doesn’t necessarily recommend barefoot running in general, some people may benefit from it. “For people who have had multiple impact-related, stress-related injuries, barefoot running can be a better tolerated option for them. So, if someone has ran for a long time and their knee is starting to wear out, they can try barefoot running because it adds a new shock absorber. You get to use another muscle group to absorb some of the shock when you run,” he said. Full disclosure: Dr. Ho is a sometimes-barefoot runner. Dr. Beth Jarrett, podiatrist and professor at Rosalind Franklin University of Medicine and Science, says that unknown roadways for barefoot runners present the real risk. “Probably the bigger issue in terms of injuries with barefoot running is the fact that you’re barefoot, and more likely to step on stones or glass,” she said. Dr. Jarrett says she would not generally recommend barefoot running, unless someone had access to a safe running environment to minimize the risks of injuries from unknown surfaces. 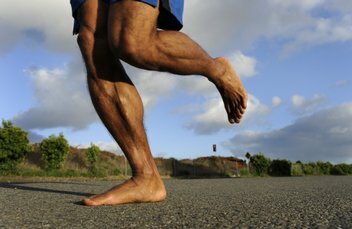 Dr. Michael Chin, sports medicine podiatrist and medical director of The Running Institute, says barefoot running is a good training tool to improve the mechanics of running, but he doesn’t recommend it for long distances. As Dr. Jarrett says, if people are not already runners, they shouldn’t try barefoot running out of the blue. “It’s important to remember that just as not everyone is meant to be a runner, not everyone is meant to be a barefoot runner,” she said.